The Brooklyn Nets, after a day of rest, go back home to face the Chicago Bulls. This could be a very good opportunity for Jeremy Lin against a big, quality backcourt to show how good he is right now. Looking at the bigger picture, this is a difficult matchup for the Nets. Brook Lopez won’t rest in this game, as he gets to face off against his twin brother, Robin Lopez. Robin is a better rebounder and defender than Brook, but doesn’t come close to his offensive arsenal, usually limited to scoring within 5 feet of the basket. But that’s his comfort zone, and the same goes for Taj Gibson. The Nets have problem defending the basket, and although their rebounding hasn’t been bad, they could face some serious issues on the glass against Chicago. It’s not just Gibson and Lopez. Jimmy Butler and Dwyane Wade, and to a lesser extent Rajon Rondo at this point of his career, are very good rebounders when they feel like attacking the glass. Obviously, the Bulls starting lineup is big, which means the Nets can’t afford to bench Rondae Hollis-Jefferson, despite his poor performances up to this point. His defense and ability to guard someone like Butler or Wade, especially with the softness of Bojan Bogdanovic (who is indispensable on offense right now), is something the Nets can’t afford to give up. The bench isn’t deep enough to offer too many solutions, especially with the injuries to the backcourt. Sean Kilpatrick should see more minutes, but I’m not sure Kenny Atkinson sees it that way right now. What about Lin? After a good game in every aspect but shooting, look for a strong performance. With Lopez playing, it’ll be easier getting to the basket. Trevor Booker can’t be ignored anymore, as anytime he moves towards the rim he becomes a threat. The same goes for Lopez, and for Bogdanovic, who might be able to put Wade or Butler in foul trouble. Butler is the better defender, so off ball screens to free him up or move him towards Wade will benefit the Nets. Lin won’t have a problem finding him whenever he’s open, just like he did in the last two games, with 19 total assists. 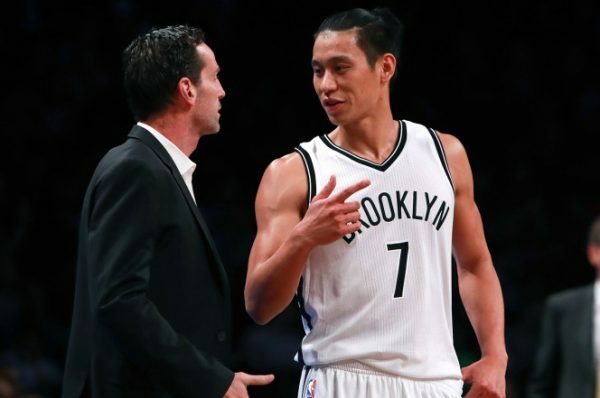 The key offensively, which isn’t new, will be putting Lin in control of the offense, and working for him. Screens, pick and rolls, and plenty of motion off the ball, but keeping Lin in charge of where the ball goes. The Bulls have big players with long arms. It’s better to have someone who knows what he’s doing trying to thread difficult passes through than an inferior passer. As for his scoring? The points don’t matter. At home, I’m assuming he’ll get more respect from the refs and take more than five shots from the line. The Nets have a comfortable home stand coming up; not because of their rivals, but because they’re playing at home and getting at least on day of rest between each game. This means no reason to leave out Lopez or not have Lin on the floor for 33 minutes at a time, especially with the backcourt injuries limiting Atkinson’s options. Starting to talk about win numbers might be premature, and the Bulls do offer a difficult challenge physically. Personally, I’d be disappointed without at least two wins in the next nine days.